Hedges have been used for centuries for security, marking ownership of the site, sustainable timber sources, and reducing soil erosion. Hedges can add habitat diversity to a site, without affecting its overall particular function. Hedgerows serve as wildlife highways (also known as corridors) that connect small fragmented areas of woodland, pond, marsh and meadow. In parts of the country where few woodlands remain, many of the species that once lived in woods now depend on hedgerows for survival. Hedges provide fruit, nuts for wildlife, and fuel and poles for humans. From 1984 and 1993 the UK lost 250,000 km of hedgerow due to increases in agriculture, urban development, and road construction. In recent years many hedgerows have been neglected, resulting in their dereliction, whilst others are trimmed too short affecting the hedges survival rate. The traditional method of managing hedges in farmland evolved as a method of producing stock proof barriers from native tree species. Tree species were selected which produced thick or thorny growth when trimmed or lightly browsed by stock, and which if left to grow, could be partially cut through and laid horizontally to form a barrier, and then would resprout from the base. Hedgelaying has traditionally been done to retain the vitality of a hedge. Hedges eventually all require management at intervals of 10-25 years, this is to keep them as thick, evenly grown, stock proofed boundaries. Regular maintenance of hedgerows is done by trimming, laying or coppicing, or a combination of these. A tall thick, bushy hedge is more valuable for wildlife than a low, thin one. When possible hedges should be allowed to grow to a minimum of 1m wide and 1.8m tall, and laid when it has reached around 3m tall. Hedges should only be managed between November and March, to avoid damage to the hedge and its resident wildlife. Cut a group of hedges on a two to three year rotation, this reduces disturbance to wildlife and results in a bushier hedge that produces a wealth of flowers for insects, birds and small mammals. Summer cutting not only disturbs nesting birds, but also causes slow growth of the hedge and effects seed production. There are 4 types of hedge, a laid hedge, a coppiced, pollarded and informal hedge. Coppicing (cutting at the base) hedges are done on a 10-15 year cycle, and pollarding (cutting top of trunk) on a 5-10 year cycle. Laying involves the partial cutting of selected main stems (pleachers) at ground level, at an angle of 30-45 degrees. These are then held in position by vertical stakes. In some instances the stakes are secured along the top by woven lengths of pliable wood called binders. Clearing - The base of the hedge is cleared of Bramble and ground vegetation to give room to move. Elder is usually cut out as it smothers other species due to its vigorous growth. 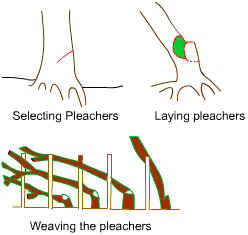 Selecting Pleachers - Pleachers are the stems of the trees that are cut and laid, a good pleacher should be straight growing (i.e. upright), and ideally from 10-20cm in diameter. Young ones are better than old ones as they rejuvenate quicker. Laying pleachers - Pleachers are cut with a bill hook, axe or saw about 3-10cm above the ground. The cut needs to be deep enough to lower the pleacher into place, retaining an uncut hinge of bark, sap wood and cambium (wood core) to allow the pleacher to grow. Stakes - These are knocked into the ground at regular intervals, into which the bushy top of the pleachers are woven. You can buy prepared hazel or ash stakes, but you may be able to get some from the clearing process (step1).